1400 start time on Sunday (Mar 3rd) so try to arrive by 1330!! By Public Transportation: Take Orange Line 3 to Hongjae Station (#314)(600 won). Leave Subway by Exit 2. Look for Shuttle bus # 2 (300 won). 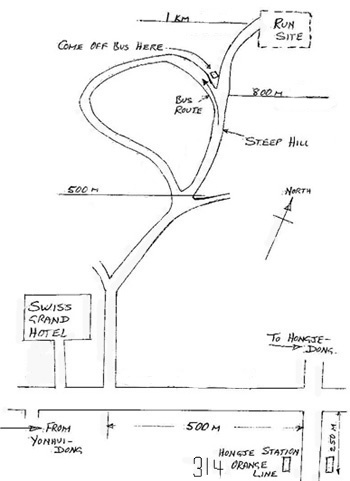 Take # 2 shuttlebus towards the Swiss Grand Hotel, up the hill all the way to the turn around point (see map). Walk up road to the right to the parking area. Get ready to hash! By Car: Locate Swiss Grand Hotel on a map. If approaching via hongje from the south, turn left under the Nambu expressway and then take the first right before the hotel entrance (see map). If you're approaching from Yonhi-dong area, turn left just past the entrance to the hotel (see map). Follow road up to parking area using the map. Call 011-9703-0026 if you get lost. There will be snacks afterwards and everyone is encouraged to bring something to share for a post-hash picnic/BBQ. There will be at least one small grill.